MIle 47: View of the Erie Canal Trail that we biked for abut 45 miles today. While not paved, it was very hard packed dirt with fine gravel – not difficult for a road bike to travel. We will bike a total of 95 miles on the Erie Canalway Trail. Today was another perfect day for biking. After 20 miles of biking on country roads, we arrived in Lockport, NY to begin our 95 mile ride over two days on the Erie Canalway Trail. 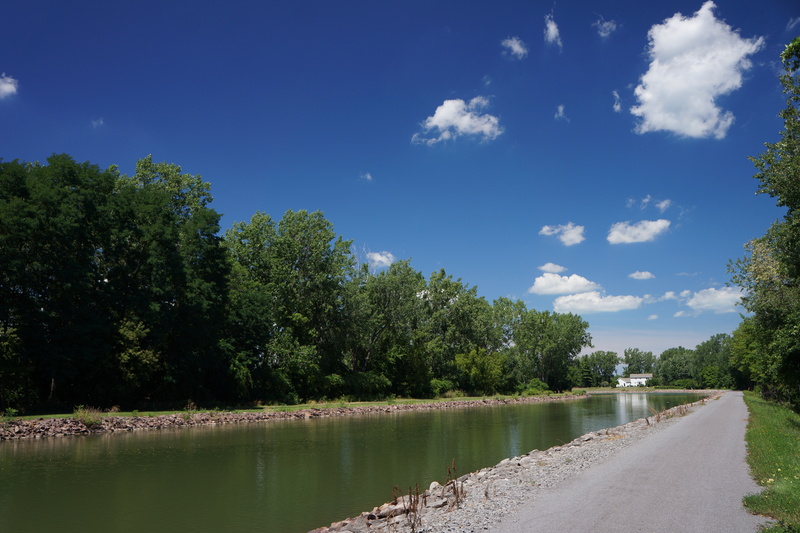 While the Erie Canalway Trail was not paved, it was hard packed dirt with fine gravel in most places and not difficult for road bike travel. It was very lightly travels by casual bikers, runners, and hikers. Except for a 10 miles stretch where the canal drained (see photo below of explanation), it was a very beautiful ride. 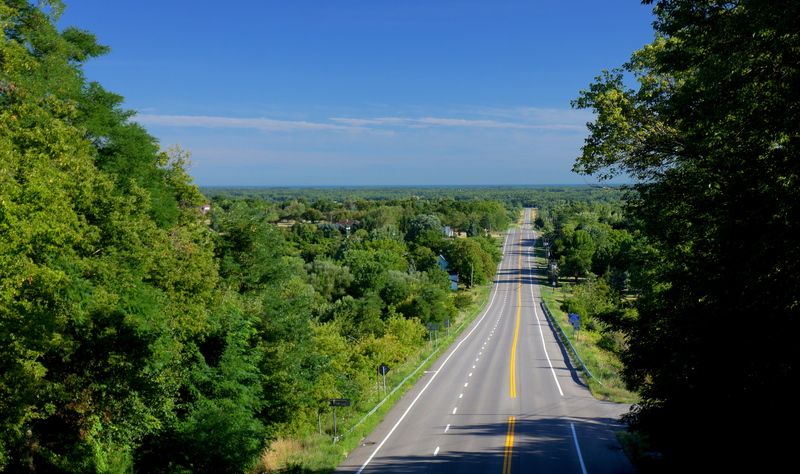 Our destination of Brockport, NY is a quaint college town (SUNY-Brockport). Dale was a professor at SUNY-Brockport prior to starting Classic Adventures. After 2,000 miles on my tires, I decided to replace them at the Brockport bike shop even though the tires seemed to still have some life in them. I have ridden nearly 3,500 miles without a flat tire and hope to maintain that record until I reach the Atlantic Ocean. Besides bike servicing, I used our rest day in Brockport to do laundry and catch up on my blog. Dale and Diane hosted a reception at their beautiful home on August 8th for the cyclists continuing to Freeport, ME – Doug, Jim, Robert, and me as well as 7 new cyclists, Bill from Southington, CT, Susie and Dave from Grand Rapids, MI, Steve and Sharon from Los Gatos, CA, Mollie from Coral Gables, FL, and Greg, a fellow Delaware Valley resident from Valley Forge, PA. Three more cyclist are to join us over the next several days. Unfortunately, one person had to cancel at the last moment. The evening was very enjoyable and made a family event with the addition of two of Dale’s and Diane’s son’s (Nate and Benton), their wives and children (including a 10 year old boy who is an accomplished pianist and played for us). Their son Nate is featured in my early posts as he biked with us from Anacortes, WA to Minot, ND. Their son Benton has been the owner and president of Classic Adventures for the last 10 years. Dinner at the Hamlin Station Bar & Grill completed the perfect start for the final leg of the tour for the new group of cycle adventures. 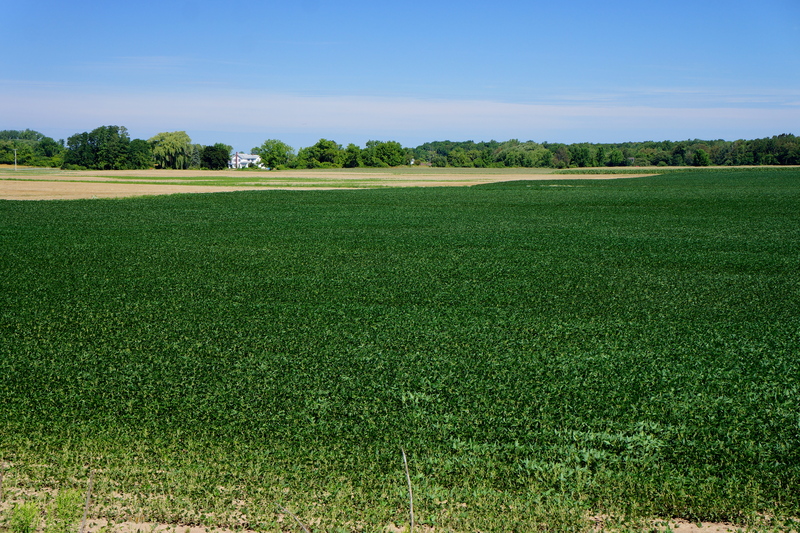 Mile 12: View of the countryside I biked through this morning near Pekin, NY. 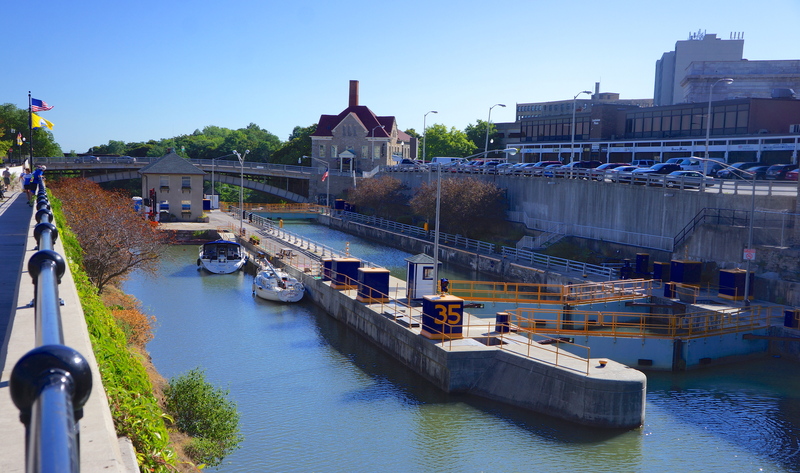 Mile 20: View of the locks at the beginning of the Erie Canalway Trail in Lockport, NY. 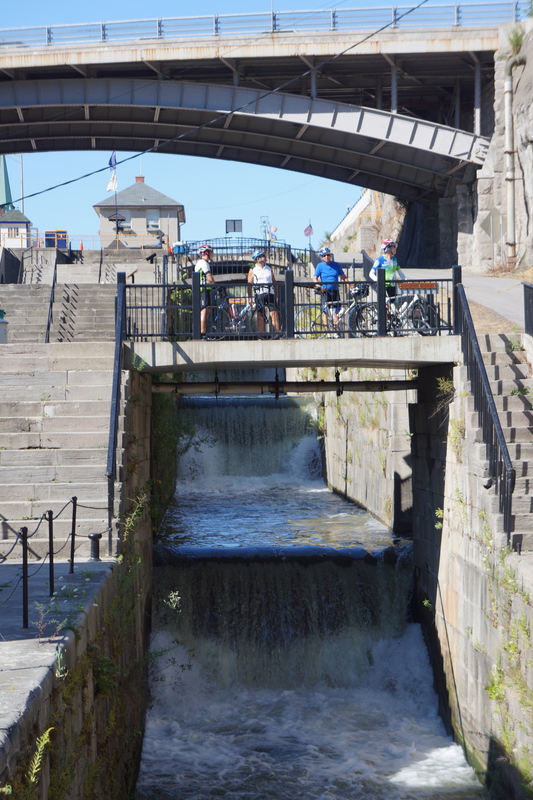 Mile 20: View of the water falls which are part of the locks in Lockport, NY – Doug, Dale, Jim, and Robert on the bridge. 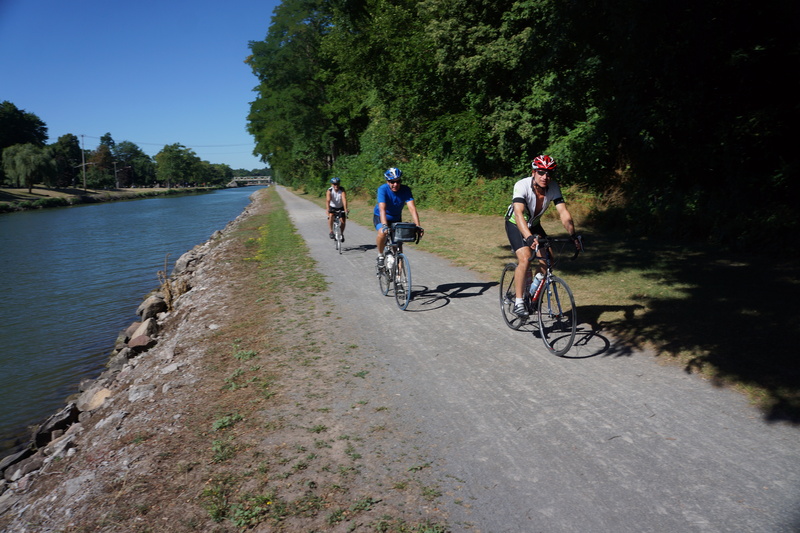 Mile 22: Dale, Jim and Doug biking the Erie Canalway Trail shortly after leaving Lockport, NY. 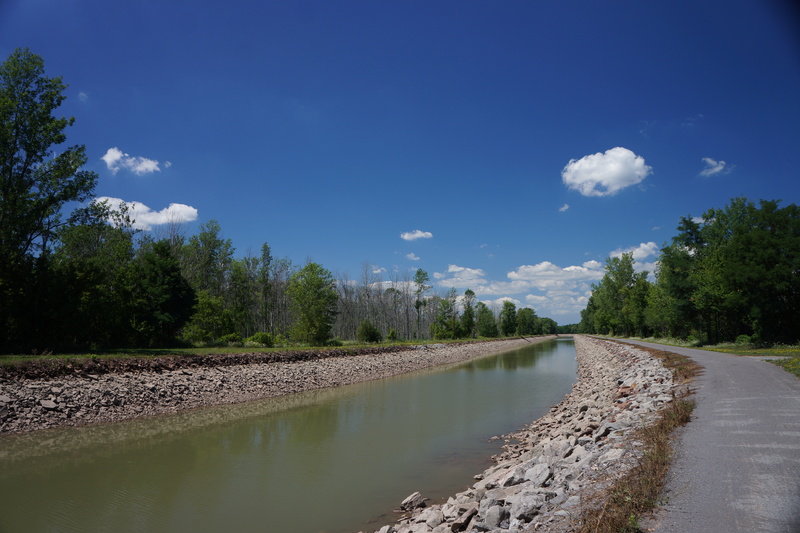 Mile 29: An example of one of the dams on the Erie Canal (near Gasport, NY). Mile 35: View of the countryside next to the Erie Canalway Trail. Interestingly, the crops we passed today were very diverse, e.g. grapes, corn, apples, and tomatoes (I could not identify the crop in this photo). Mile 43: At one point the Erie Canal was completely dry and I didn’t understand why. 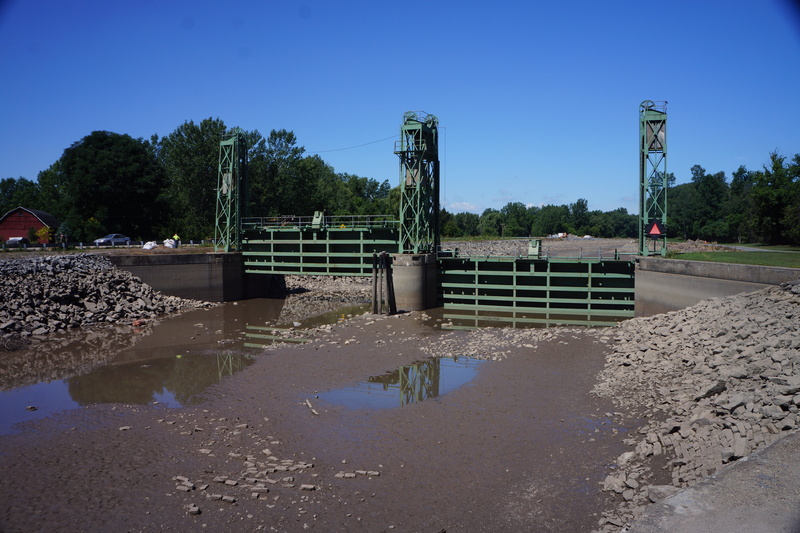 It became apparent near Albion, NY (shown in photo) that a canal side wall had collapsed and a 10 miles section of the canal had been drained so repairs could be made. 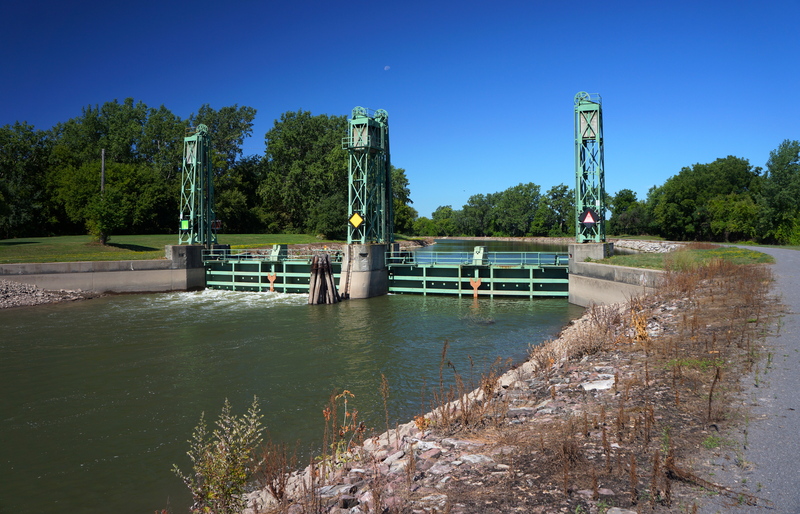 Immediately after Albion the Erie Canal was full of water. Mile 54: View of the Erie Canalway Trail near Holley, NY. 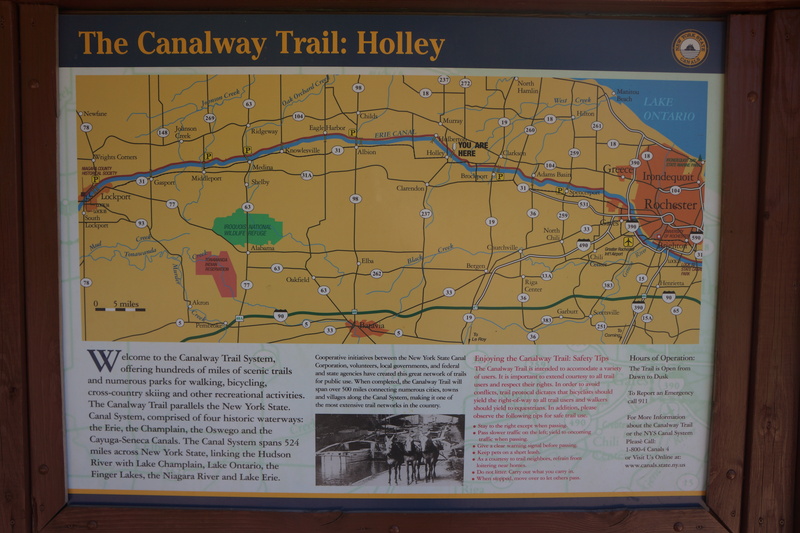 Mile 60: Map of a portion of the Erie Canalway Trail (Lockport to Rochester, NY). We will bike a total of 95 miles on the Erie Canalway Trail. This entry was posted on August 9, 2012 by Steve. It was filed under Photograph of the Day .